HURRY TO BECOME PART OF E CONDOS! ≈ Comments Off on HURRY TO BECOME PART OF E CONDOS! Bazis Inc.’s fabulously successful E Condos is now under construction. If you drive past Yonge and Eglinton, you will see that the hording is up on the northeast corner, and some of the existing retail shops on the property are being removed. All of this is in preparation for the exciting residence and changes to come at this significant intersection. Suite owners will have direct underground access to RioCan’s Yonge Eglinton Centre across the street, which is undergoing an extensive renovation and expansion of its retail spaces and office towers. Residents of E Condos will also be right next to the new light rail transit system, making it a commuter’s dream. Once all of the construction at these four corners is complete, midtown Toronto will have as much appeal as midtown Manhattan! 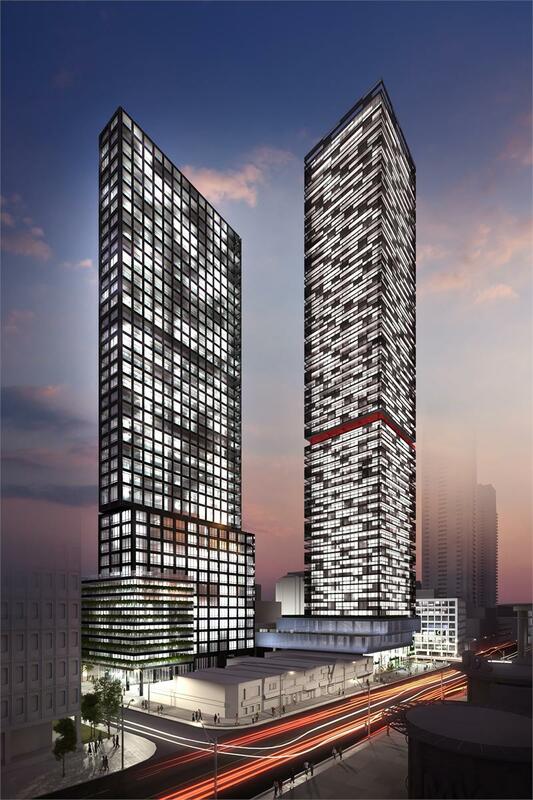 The design for E Condos features a gorgeous black, white, grey and bold red glass exterior. The brainchild of renowned Rosario Varacalli, the architecture is stunning. Interiors are by prominent designer Mike Niven, so you know everything will be exceptional. Owners will have some of the most intriguing amenities in Toronto, including a cantilevered glass-enclosed pool extending out from the 31st level to offer panoramic city views. A gorgeous party room, indoor and outdoor lounges, an international gourmet kitchen, formal dining room and tremendous fitness facilities round out the picture. At ground level, a public piazza with retail venues adds convenience. You will still find a great selection of suites available with luxurious standards including Mike Niven-designed kitchen and bathroom cabinetry and pre-engineered flooring. Now is the time to become part of this iconic corner. Visit the Presentation Centre at 2300 Yonge Street or www.econdos.ca.